This bin is has been adapted to suit your needs. 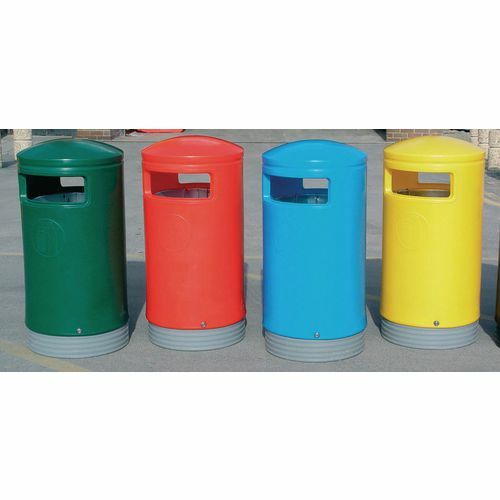 It has a capacity of 75 litres, a height of 1000mm and a diameter of 485mm so it can hold plenty of waste. This product is suitable for outside or inside and there is also an optional concrete ballast pack or floor fixing plate available, it has a hooded top to prevent rainwater from seeping through. This bin has a removable red body and is easy to empty in addition to a smooth surface which is easy to clean. This product comes complete with a liner, lock and base as well as a 12 month guarantee for your peace of mind.